If you want to gift, sell or display your art, you can create a good impression if the back of your painting looks (nearly) as good as the front. In this video I will show you how I have been adding a dust cover, painting label and hanging hardware to the back of my paintings. There is more than one way to hang and finish a painting, and I won’t go into a huge amount of detail here or talk through all the different materials, options and tools etc. If you are displaying your art professionally in a smart gallery they will most likely have a set of guidelines to follow, but for gifts and sales, something neat but simple will usually suffice. Here’s a quick video on how I do mine. Extras – you might like to add little foam, felt or rubber pads to the bottom corners of your painting where it touches the wall. I didn’t have any but they do prevent the painting marking the wall and also help it to hang straight. I suggest something like these. Get it in a kit – you can get a great kit here which has every thing you need. 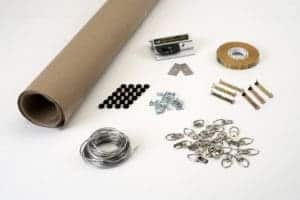 The kit includes the F60 Dust Cover Trimmer with two extra blades, a large roll of dust cover paper, 20 feet of heavy duty coated picture framing wire, saw tooth hangers, felt bumpers, D-rings with screws, a roll of ATG tape, and fully illustrated instructions. It’s been a week now since I stuck on that brown paper and so far so good. No sign that it is coming up. I really do think there must have been some oil on the back of the previous canvas I tried. If you can’t get the tape to stick, you can always use any regular household adhesive. This is the one I usually use for this sort of thing, called Weld It – sticks all sort of things. I hope this quick video was helpful. Do let me know any other topics you would like me to cover. Great video! Just a heads up, I’m not getting my emails from you for some reason. You mean the newsletter Jackie? It could be going to your spam folder. You may need to add my email address to your contacts to make sure it appears in your inbox – or whitelist it as safe. We will miss you and will be praying for you to get well quickly. Great video on how to finish the back of the canvas. Looks fantastic. It has bothered me about what to do and now I have a nice way to finish my paintings off. Best of luck to you with your surgery. Prayers and thoughts are with you this holiday season. Just watched your video on preparing back of pour painting. I recently took 2 paintings (acrylics) to a professional framer, as frame was compulsory for competition. I was informed that canvas should not be covered with paper on the back as it cannot breathe if you cover it. Framer told me I would have to take to another framer if I insisted on covering the back with brown paper. When I asked my instructor at art class the next day, he said that was true about oil on canvas but he wasn’t sure about acrylic. Any comments? 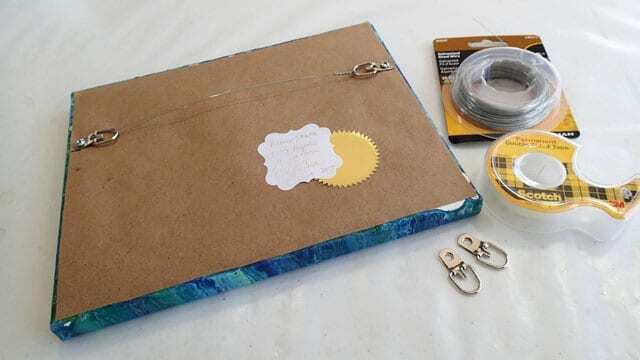 I would be surprised if anyone thought that they could create a perfect hermetically sealed, airtight seal on the back of a canvas with a piece of brown paper. Impossible for sure. If you watch shows like the Antiques Roadshow, paintings turn up there every week with paper on the back of them and none of those have spontaneously combusted yet! Personally I think that is nonsense. I suggest doing as he says, and take your work to another framer. Deby is based in the Cayman Islands. The rest of us are primarily US based. It’s tough sledding getting certain supplies like floetrol to locations like Gibraltar. We’ve used freight forwarders in the past, but this gets expensive, so we recommend you buy in bulk in those cases. Hi Sonia, it should work as long as done correctly. It certainly could tear, but if you’re careful and follow the methodology here, you should be in good shape! Thank you! Because I was kean to get this done, I asked some artist friends and they suggested an acid free mat board for larger paintings. So I’m going to give that a try. Thanks for the inspiration, though. Nice to know we can cover the canvas for a neat presentation. 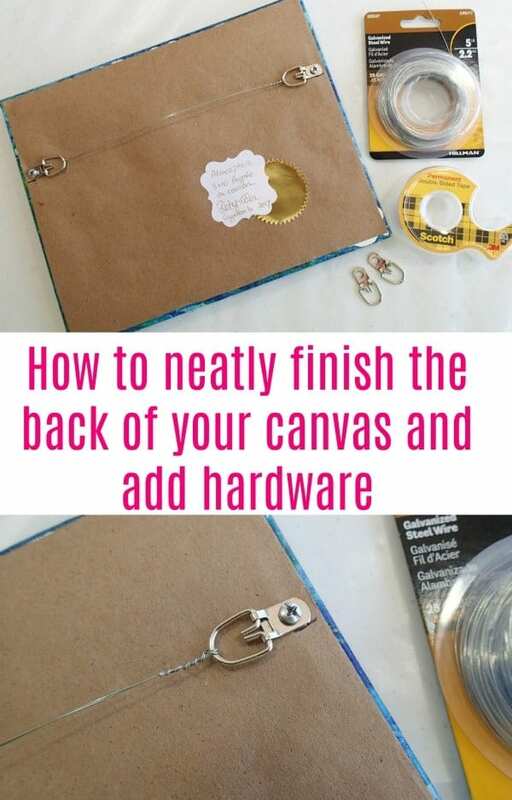 It can be easy to finish the back of the painting art with your dust cover as if you have proper tools available in your home and proper technique to apply it as it needs some tricky to hang the wall art on the wall with proper care of it.